Dr Unwin's work with Diabetes and the Low Carb Diet published in three new books. We are pleased and proud to inform you that Dr Unwin has had work with his Diabetes and the Low Carb Diet published in three new books. Dr David Unwin - National Innovator of the Year 2016! As winner of the North West NHS Innovator of the year, Dr Unwin was automatically entered into the National Finals 2016. 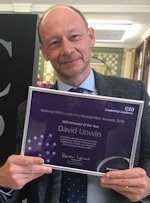 We are thrilled and very proud to announce the award went to our very own Dr David Unwin. Well Done, very well deserved!